English merchant Samuel Vaughan created the first park in the U.S. Located at the State House in Philadelphia, the design celebrated native species and Federal Era values. English merchant Samuel Vaughan was the youngest of twelve children of Benjamin Vaughan (b. 1679) and his wife Ann, née Wolf (b. 1677). He arrived in Philadelphia in 1783, and, during his brief sojourn in the young United States created one of the most important public gardens of the Federal Era, the State House Garden. 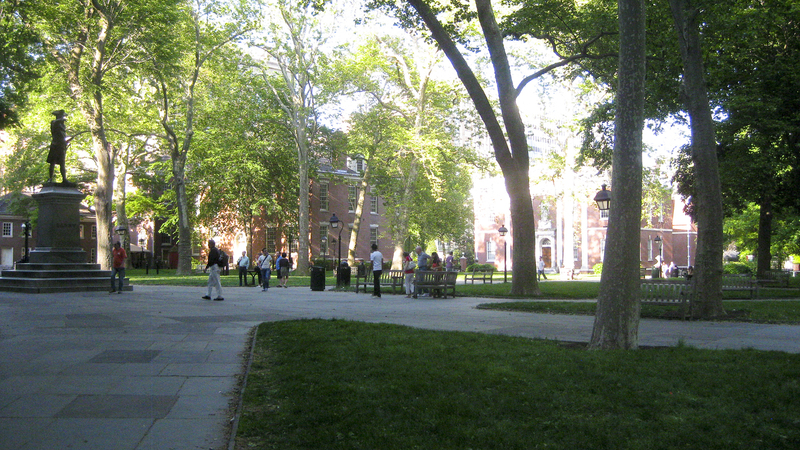 Re-named Independence Square in 1826, this space survives as the landscape setting south of Independence Hall, although this open space has undergone a number of renovations and alterations since Vaughan first created a garden there in 1784-1785. Before returning to England in 1790, Vaughan also completed one of the best-known historic plans of the garden at Mount Vernon (1787), which he presented to George Washington as a gift. 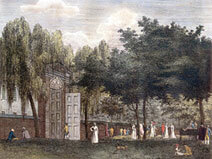 Along with the State House Garden, Vaughan had a key role in the design and creation of the former Gray’s Inn Garden in Philadelphia, one of the most visited places for public entertainment in the period when Philadelphia was the national capital during the last decade of the 18th century. Vaughan made a substantial fortune in plantations in Jamaica (where he lived for a period and where he was among the wealthier landowners) and as a merchant in Atlantic trade. His mercantile contacts included Benjamin Hallowell of Boston. 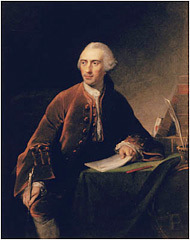 He married Hallowell’s daughter Sarah (1727-1809) in 1747. The couple had eleven children, several of whom settled permanently in Hallowell, Maine and in Philadelphia. According to his only biographer to date, Sarah Stetson, Vaughan came to Philadelphia soon after the Treaty of Paris principally because of Whig political views and his “love of liberty.” Samuel Vaughan clearly was an enthusiastic supporter of the young republic and of its new cultural institutions and organizations in the brief period he spent in the United States. His close relationship with Benjamin Franklin was clearly one factor in his American sojourn and in his involvement with the American Philosophical Society. While he was in Philadelphia, Vaughan became a founding member of the Philadelphia Society for Promoting Agriculture, and a manager of the Philadelphia Dispensary, but the American Philosophical Society received his particular attention. In 1784, he was first elected a member, and then a vice-president. Vaughan was one of the leaders in creating a permanent home for the organization, making substantial donations (second only to Franklin, the Society’s president) to the funding of the construction of Philosophical Hall, which began in 1785. Among the more than 700 individual plants 100 were American Elms. Also listed were native understory species such as dogwood and redbud, and shrubs, including mountain laurel. Period images also indicate that weeping willows—then a fashionable exotic in American gardens—flanking the southern gate to the garden were a prominent feature. 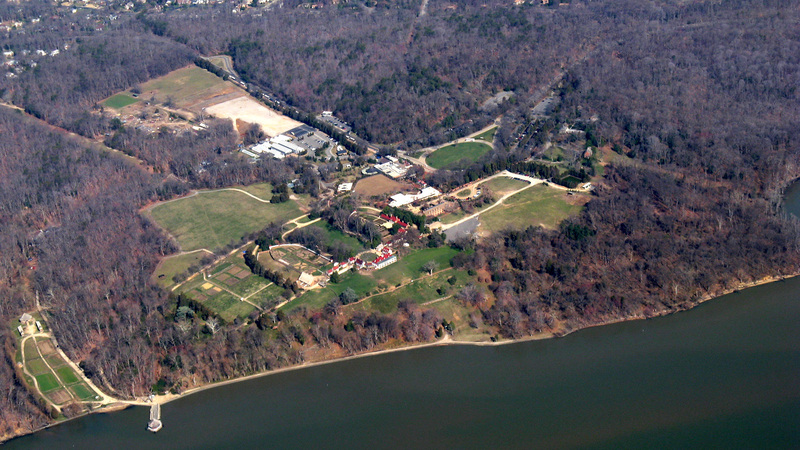 Vaughan’s project also included a number of aspects typical of Anglo-American gardens of the period, including serpentine gravel walks, as well as allées, shrubbery groves, and grouped plantings of trees, as well as raised grass mounds or small berms that served for seating along with Windsor settees and chairs. The year before Cutler visited the Gray’s Inn gardens; Samuel Vaughan’s wife fell ill, and returned to England. In the fall of 1787, he traveled to Mount Vernon, where he drew a plan of Washington’s garden, recording many of its important details. At the end of 1787, Vaughan sailed to Jamaica from Philadelphia. He lived in the Caribbean until he permanently returned home to England in 1790. He died in Brighton in December, 1802. In addition to his work on the State House Garden, Vaughan also had a key role in the creation of the extensive gardens at Gray’s Inn, which stood on the western shore of the Schuylkill River. The diarist Rev. 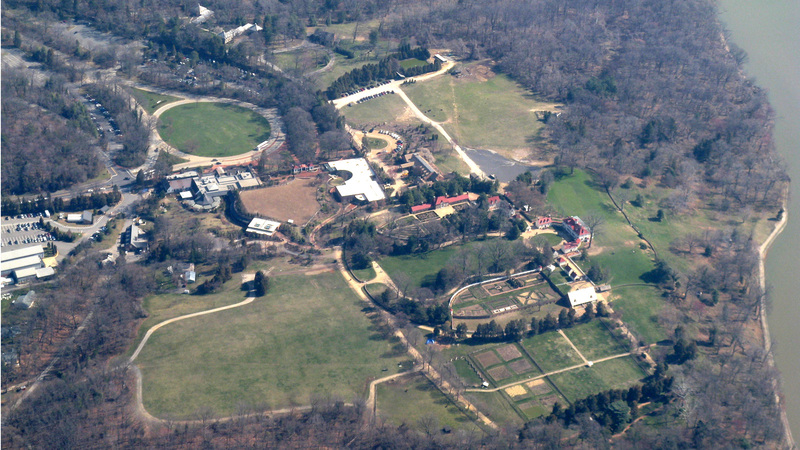 Manasseh Cutler, when visiting Philadelphia in the summer of 1787, recounted that Vaughan had helped “plan the works” of the grounds and to procure “a gardener from England” for the project. Cutler’s description of the results, which included walks, floral plantings, hermitages, arbors, grottoes, summer houses, and cascades, indicates that it was one of the most remarkable gardens of its period. Anon. 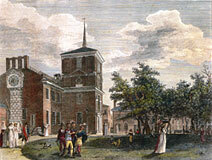 "Account of the State House of Pennsylvania." Columbian Magazine 1 (July, 1787): 513. Anon. "Explanation of the Plate, Exhibiting several Public Buildings in the City of Philadelphia." Columbian Magazine 4 (January, 1790): 24-26. Cutler, William Parker and Julia Perkins Cutler, eds. Life, Journals and Correspondence of Rev. Manasseh Cutler, L.L.D. Vol. I. Cincinnati: Robert Clarke & Co., 1888. Rowell, George S. "Benjamin Vaughan, Patriot, Scholar, Diplomat." The Magazine of History 21, no. 3 (March, 1916): 43-57. Sheppard, John H. "Reminiscences and Genealogy of the Vaughan Family." New England Historical and Genealogical Register 19, no. 4 (October 1865): 343-356. Stetson, Sarah. "The Philadelphia Sojourn of Samuel Vaughan." Pennsylvania Magazine of History and Biography 73, no. 4 (October 1949): 459-474. Vaughan, Samuel. "Journal of a tour through Pennsylvania, Maryland, and Virginia, June 18-September 4, 1787." Collection the American Philosophical Society, Philadelphia.